Join 17th Street Barbecue for the 7th annual Whole Hog Extravaganza seminar and invest in your business, your network, and your dreams. Building a barbecue empire requires more than the ability to cook great barbecue. Not only must you master all aspects of the restaurant business; you have to adapt to ever-changing trends, technology, and ways of conducting business. Pitmasters at the top of their game invest in continuing education. Similarly, they constantly build relationships in both the barbecue and restaurant communities. Above all, you’ll hear from a powerhouse lineup of legendary and celebrated pitmasters, restaurateurs, and marketing professionals discussing topics that will directly impact your business. 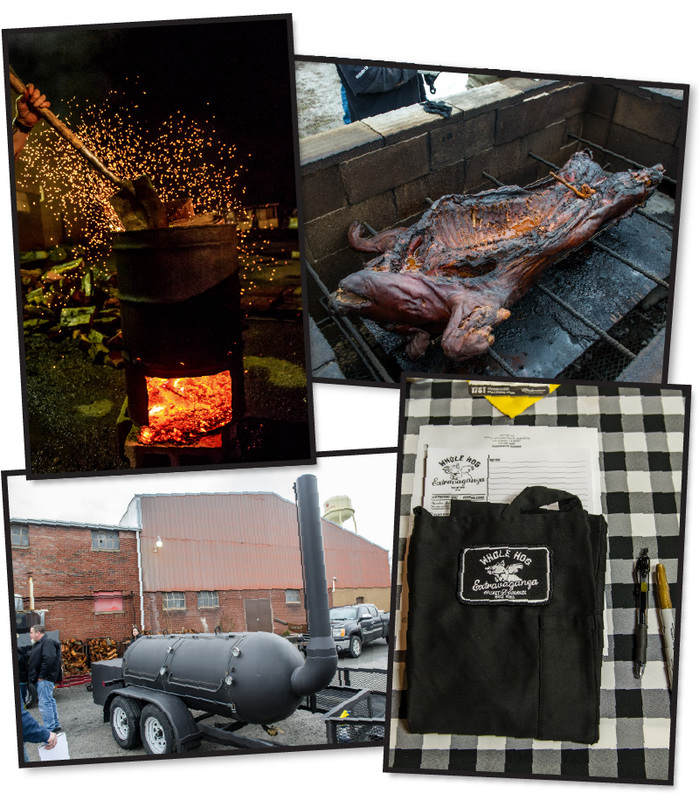 So whether you’re a seasoned or aspiring restaurateur, barbecue competitor, or a lifelong super enthusiast, we invite you to continue your education at the 7th Annual Whole Hog Extravaganza/Brisket Bonanza/BBQ MBA seminar on January 15th and 16th! This two-day event is packed with speakers, relevant seminar topics, and networking opportunities. Even more, it’s all designed to connect you with the ultimate tips of the barbecue trade that you can’t find anywhere else. Presented by OnCue Hospitality Consulting, the Whole Hog Extravaganza seminar takes place at the legendary 17th Street Barbecue in Murphysboro, IL! In addition, the classes explore a variety of cooking methods and demonstrations from prep through finished product for whole hogs, brisket, sausage, and more. During the BBQ MBA portion of the program, hear advice from this group of top talent. Bring your appetite too, because all the food will be sampled! You’ll also get a peek behind-the-scenes at the 17th Street operation. Here’s an insider’s look at last year’s event. Every year, our lineup of top pitmasters, speakers, and press varies to bring you a fresh, relevant, learning experience. Check out this year’s lineup below! THIS EVENT SELLS OUT. Remember, space is limited to just 35 participants in order to provide ample opportunity for learning and networking. Click here for your all-access pass! Mike Mills, Amy Mills and Phillip Heern of 17th Street, known as “The Legend,” “The BBQ Heiress,” and “The Right-Hand Man,” respectively, graciously host the event! While Mike is the most decorated pitmaster in America, Amy is the industry’s go-to girl for all things barbecue, and Phillip is an integral part of the crew. John Lewis and his barbecrew opened Lewis Barbecue in Charleston in 2016. Barbecue enthusiasts flock to his pit year after year and wait in long lines to taste his expertly smoked pork spareribs, beef ribs, “Texas hot guts” sausage, oxtail and his legendary beef brisket. Aaron Kleidon, brewmaster, co-owns Scratch Brewing Company, a farmhouse brewery in Ava, Illinois. Named one of the top four breweries for foraged beer by Outside Magazine, Scratch Brewing Company also focuses on farmhouse beers and other styles brewed with home grown and locally farmed and foraged ingredients. Kat Kinsman, Journalist and author of Hi, Anxiety, is also the founder of Chefs with Issues and the Senior Food and Drinks Editor at Time Inc.’s all-breakfast site Extra Crispy. Barry Sorkin, former IT professional, opened SMOQUE BBQ in 2006. It quickly developed a reputation for serving some of the best BBQ in Chicago. He’s also the co-founder of the Illinois BBQ Alliance. Tom and Shelley Niemeier of architectural and design firm SPACE STL, specialize in strategic planning, interior design, historic renovations, and more. Tom is a Registered Architect with over thirty years’ experience in the design industry. In addition, Shelley works closely with clients to develop cohesive branded themes in their new spaces and on a variety of interior design projects in the office. Roderick Weaver is no stranger to the beverage scene across the country with nearly two decades of experience. After mastering the art of mixology, Weaver started his own firm, BarWeaver Consulting, in 2013, where he has helped create and mentor notable bar programs like OBC Kitchen in Lexington and Lewis Barbecue in Charleston. Murphysboro is in the path of totality for the upcoming eclipse on Monday, August 21, and we will be completely dark for 2:39 minutes. Adler Planetarium astronomer Mark Hammergren, PhD will talk about the fascinating phenomena that appear during the entire eclipse. He’ll point out visible planets and answer your questions. Mark Hammergren, PhD, is an astronomer at the Adler Planetarium. His research interests include asteroids, comets, meteorites, and their effects on life on Earth, and the history and sociology of the flying saucer phenomenon. He directs the Astro-Science Workshop, a summer program for science-interested high school students currently in its 49th year, and co-founded the Adler’s Far Horizons citizen space exploration team. Muddy Brewing and other local restaurants on Saturday, Sunday, and Monday from noon to 10 p.m. You can check out the details on the Facebook event page. Here is a good read about safety and protecting your eyes during the eclipse. And here is information specific to Murphysboro with the timing details. Thanks to the Chicago Tribune for selecting 17th Street as an optimal place to eat and view the eclipse — along with a shout out for our friends at Mileur Orchard and Scratch Brewing. You can read the article here.